What does community mean in a group of preschoolers ? From Kate Dane at NAEYC.org which is a leading resource for early educators. When I describe the goals of my early childhood classroom to families, I share that social and emotional development is an intentional and significant part of our curriculum. Families need some information about how helping their children develop social and emotional skills is deeply connected to their learning. Kids need to experience being part of a group, regulating their emotions, and negotiating complex social conflicts in order to truly learn cognitive material like math concepts and early literacy skills. In my classroom, we believe that the crux of social and emotional learning is creating a classroom where children feel both empowered and invested. 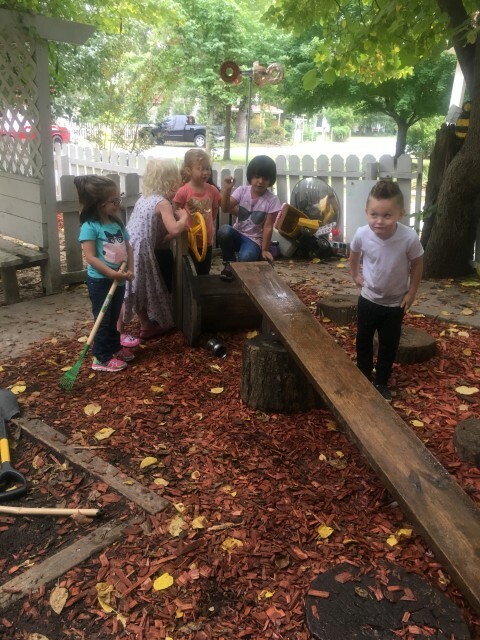 We use a variety of strategies to facilitate children’s individual skills as they interact with peers and learn to navigate the complex issues around them. The key to teaching children social and emotional skills is creating a classroom culture built on community. Strong communities have members who have shared goals and experiences, who feel empowered to contribute, who trust in one another, and who feel understood and capable as individuals. These attributes enable teamwork, cooperation, a willingness to negotiate, and the ability to draw on one another’s skills. Today the children started a game with the water and the large board. They would pour water down the length of the board and a child would slide down the wet board. Holly and I looked at each other – I am sure thinking the same thing. Is this safe ? They are going to be so wet ? Do we stop it or see where it goes ? This is community building. This is one of our goals. When kids leave us to go to BIG school more than anything I want them to be able to look around when they are sad or scared and see their Bright Beginnings community and smile and feel safe. Long story short we built community today but your kids bottoms might be mucky .